Situated in a rural location, this romantic vacation home is 2.3 mi (3.7 km) from Castel d'Ario and within 12 mi (20 km) of Pradelle Church and Palazzo Ducale di Mantova. Ducal Palace and Mantua Cathedral are also within 12 mi (20 km). Sorga Bonferraro Station is 9 minutes by foot. Hotel Milano & Spa is on a quiet side street, steps from the Roman amphitheater, Arena di Verona. It's a 2-minute walk to Via Guiseppe Mazzini and 5 minutes to Casa di Giulietta, adorned with the balcony of Romeo's Juliet. Guests can dine alfresco at Piazza delle Erbe, a 6-minute walk from the hotel. 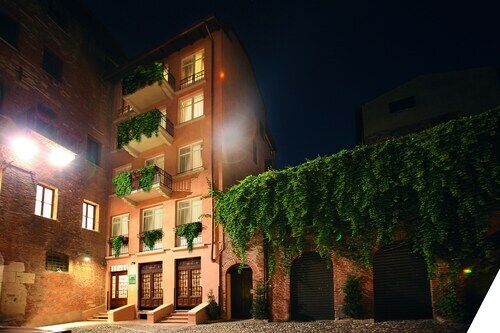 Located in Cittadella, this hotel is within a 15-minute walk of Porta Nuova and Veronafiere. Teatro Ristori and Juliet's Tomb are also within 1 mi (2 km). Verona Porta Nuova Station is 9 minutes by foot. This family-friendly Peschiera del Garda hotel is located in a rural location, 2.7 mi (4.4 km) from Gardaland, and within 6 mi (10 km) of Movieland and Canevaworld - Aqua Paradise. Villa Dei Cedri is 6.4 mi (10.4 km) away. How Much is a Hotel Room in Sorga? Hotels in Sorga start at $64 per night. Prices and availability subject to change. Additional terms may apply. So you are looking to have some time in Verona? Hoping to reserve accommodation in or near Sorga? Within an easy driving distance from the city center, travelers will find 3 suitable long and short-stay accommodation options. There are a handful of places to stay within easy walking distance from the urban core of Sorga. The Hotel Eden Mantova is a convenient option because it's merely 2 miles (3 kilometers) away. 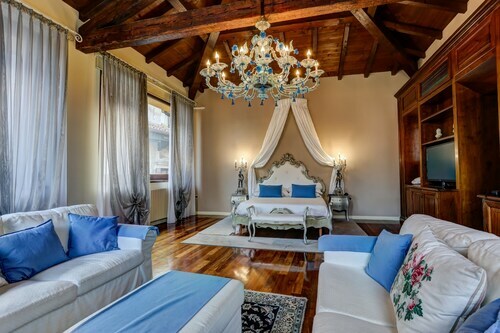 The Grand Relais The Gentleman of Verona - Guest House is around 17 miles (27 kilometers) outside the heart of Sorga. Another accommodation option is the Due Torri Hotel, which is positioned 17 miles (27 kilometers) away. Other Travelocity-listed hotels are the Locanda Ippopotamo and the Hotel Gabbia d'Oro. The wider Veneto district is certainly worth seeing too. Veneto is home to beaches, coastal plains, rivers and canals. Frequented visitor sites include ruins, castles and traditional villages. Common things to do in this pocket of Italy include snowboarding. Looking for things to do? You could spend some time enjoying Tommasi Viticoltori and Serego Alighieri Winery, which can be found in Valpolicella, 25 miles (41 kilometers) to the north of Sorga. The Villa Gesi and Hotel Valpolicella International are just some examples of the comfortable hotel choices in Valpolicella. Alternatively, you could stay in Sommacampagna, 16 miles (25 kilometers) to the northwest of Sorga, where you can choose from the Agriturismo Cà Giulietta and Hotel Antares. While visiting Sommacampagna, be sure to explore the Golf Club Verona and Equestrian Sporting Club Paradiso. If you think of sport as your life and love attending games ensure you head to Arena di Verona, which is found 17 miles (27 kilometers) to the north of Sorga. Enlightened travelers who are interested in locating a room not too far away, book in the Palazzo Victoria or Escalus Luxury Suites Verona. For modern travelers planning on arriving through Valerio Catullo Airport, you may find it convenient to book a Travelocity-listed room at Hotel Veronesi La Torre, or Residence Cà di Capri, which are each a short taxi ride away. Our room was in the Verona House, just down the street from the Hotel, was in an excellent location. Staff at the hotel couldn't have been more helpful and our room was very clean and well appointed. The only negative was that the room was very warm even with the temp set very low. We didn't send a lot of time in Verona as we were headed north to Corvara, but we loved our short time there. I could see spending more time exploring the beautiful town. A lovely hotel with a very friendly owner and staff. The breakfast was fantastic. They were extremely helpful as I was looking to move to Verona and wanted more information on the respective neighborhoods. I was able to get a lot of help and insights into the different neighborhoods. Highly recommended for vacation or business travel. 5.0 Great apartment, perfect location. Truly Verona is a great choice. The staff is extremely helpful and accommodating. 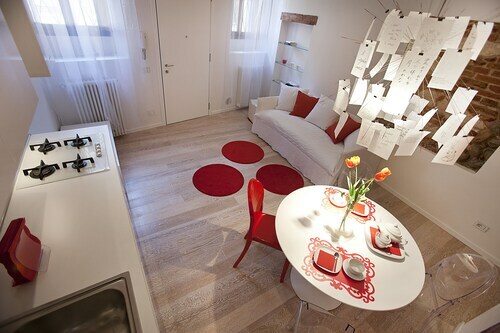 Our apartment was clean, well-furnished and in walking distance to restaurants, shops and all of Verona's popular sites. Highly recommend Truly Verona. 4.0 Close to train station and highway. Overall good hotel vs money paid. Breakfast was ok. Many options for a nice start. Location is not exceptional, however if you coming by train you might be ok. Keep in mind that is close to highway and train station, so expect noise, mainly if your room is facing highway. 5.0 Dimora storica in the heart of Verona.